Gail Wong has an undergraduate degree in Landscape Architecture from UC Berkeley and a Master’s Degree in Architecture from University of Washington. She is a practicing licensed architect in the State of Washington. Gail practices residential design, is a consulting architectural illustrator, and also teaches architectural design drawing and architectural sketching at the University of Washington. 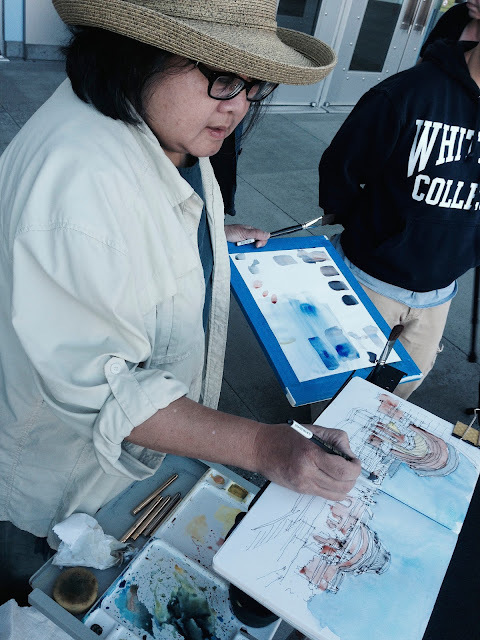 She co-teaches the “Line to Color Workshops” with Frank Ching and continues to pursue her own interests in sketching and painting. Gail has been involved in Seattle Urban Sketchers since 2009 and was the coordinator for that group from 2010-2014. Currently she is the USk Workshops Coordinator and a member of the Urban Sketchers Education Committee.